FIVE days in Bluestone really doesn’t seem enough when you see all the activities on offer. I hate to sound clichéd, but from play sessions for babies to spa experiences for adults, there really is something for everybody to enjoy. We checked out the activities online before our holiday, and pre-booked a couple to make sure we didn’t miss out. 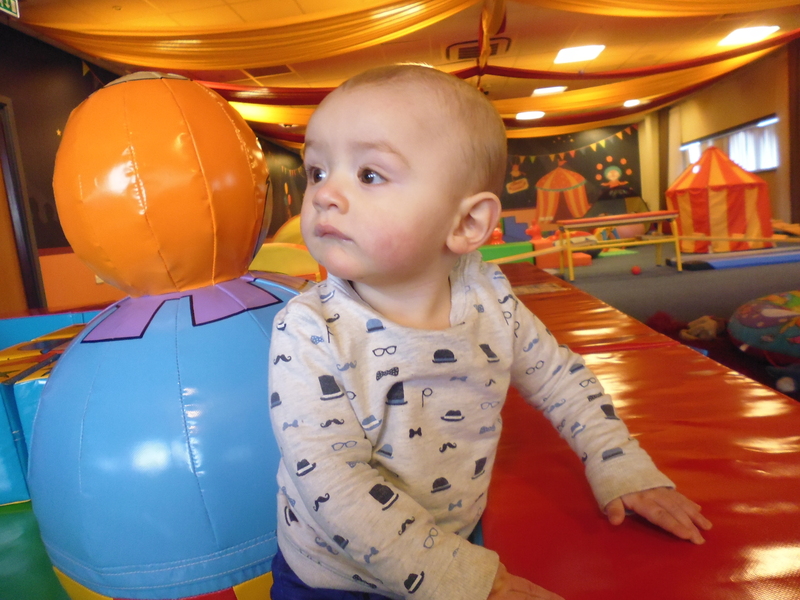 It was a bit difficult deciding what would be best for a nine-month-old as we never know how long he will sit still for, but in the end we went for sensory play and messy play. If Stew had been with us for the whole week (he had to work until Wednesday) I would definitely have booked Santi in for one of the crèche sessions … they have themed activities that last three hours and it would have been amazing to make the most of that time and had a spa treatment. Next time! I was really excited to try sensory play (especially after a disastrous DIY attempt at home) and couldn’t wait to see what we would be doing. Our session had a nautical theme (which I love!) and we started with some music and bonding activities … don’t worry, the bonding was with the babies, not the other parents .. then moved on to some water play. This would have been fine if Santi hadn’t decided to pull his bowl of water over immediately, making me point out quite loudly that he’d sat in it and hadn’t had a leaky nappy! Of course, all the other babies sat happily not causing any mischief for the whole session! The water didn’t stay in the pan for long! Half way through, we had a break for some free play time, and headed to the back of the room where loads of toys had been put out. There were touch and feel books, rattles and a tent to play in. 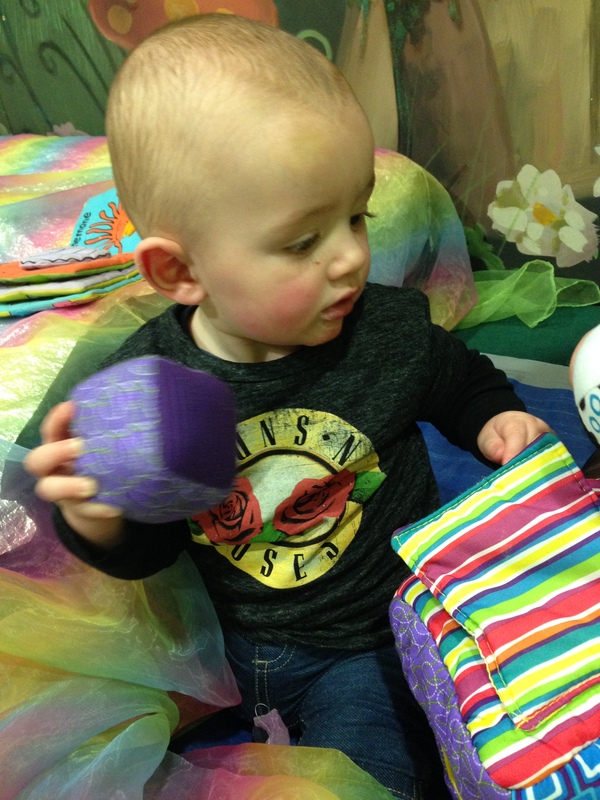 Our favourite was an air bed covered with shiny and crinkly material … Santi loved playing with the different textures and finding out what sounds they made. For the last part of the class, the babies sat in a circle and we held a sheet over them to create an under-the-sea effect. It’s hard to explain (and I wish I’d taken a photo), but there was shiny fabric that looked like fish and seaweed for the babies to play with, a bubble machine and relaxing music was playing. While I enjoyed the session, I’d recommend it for babies that aren’t yet on the move. 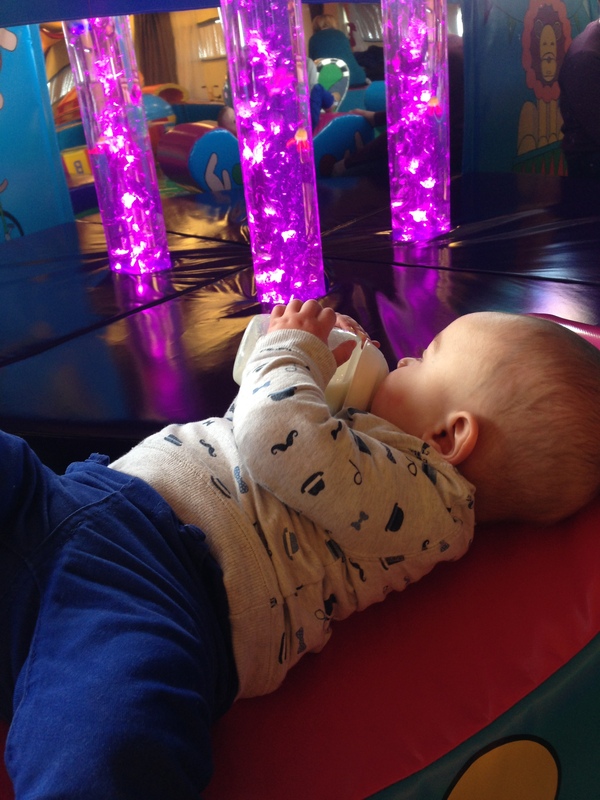 The activities weren’t really designed for babies who want to go crawling off, and it’s difficult to keep busy bees still for massage and tickles! 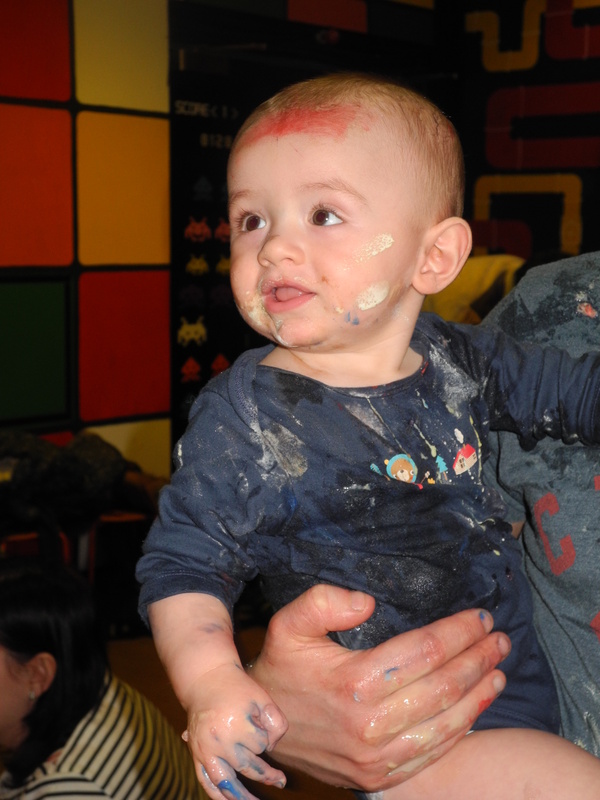 I made sure I booked messy play for a day Stew was with us so he could help with the clean-up mission after! 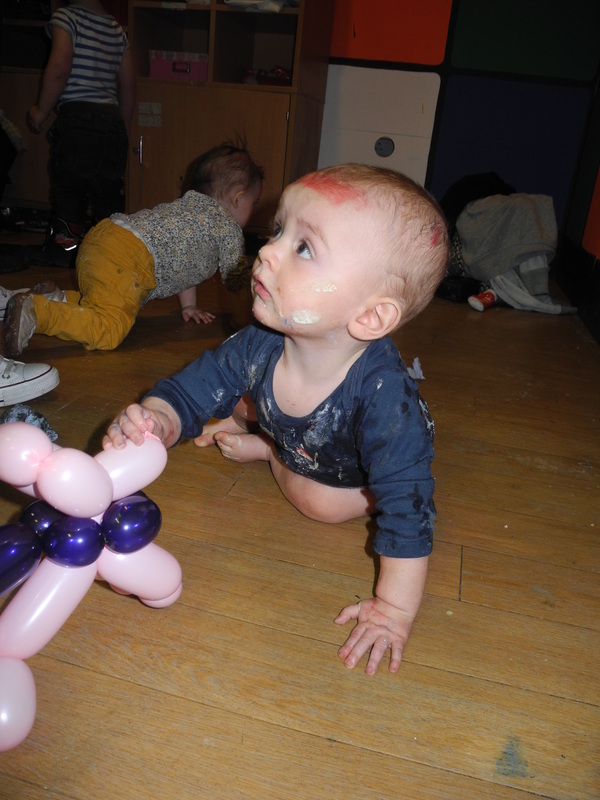 The theme was a clown’s birthday party and there were various play stations set up with different materials to get stuck into – jelly and custard; icing sugar, chocolate chips and cocoa powder; cornflower with water and food dye etc. Santi was a bit unsure what to do at first, but he soon got the hang of it, smushing bits all over himself (and daddy) … we were glad we’d stripped him down to his vest and taken a spare! Santi soon got stuck in and was covered in goo! The older children were loving it, and all took home a paper plate they’d painted, as well as a balloon animal. The balloon dog was a hit! This was definitely my favourite of the paid for activities as it’s not something I’d dare to attempt at home! I mentioned the Circus Room and Adventure Centre in my first impressions post, but it’s well worth more detail. The Circus Room is the first place we went, and we ended up going back almost every day. I was disappointed on the Thursday as it was closed, but when we popped back before leaving on Friday there was a new section! Set in a corner of the main room, and enclosed with soft play blocks, the new part was just for under-threes, which is great if you have a little one who wants to explore. There’s a set of steps leading up to a slide (which is soft enough for babies) and squishy rocking animals to climb onto. The best part was a light and bubble tube in the corner with fish bobbing up and down. This was perfect for Santi to watch as he chilled out with a bottle! 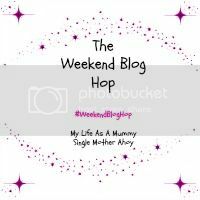 We really enjoyed the messy play, but our firm favourite of the week was the Blue Lagoon … check back for my review of the water park. 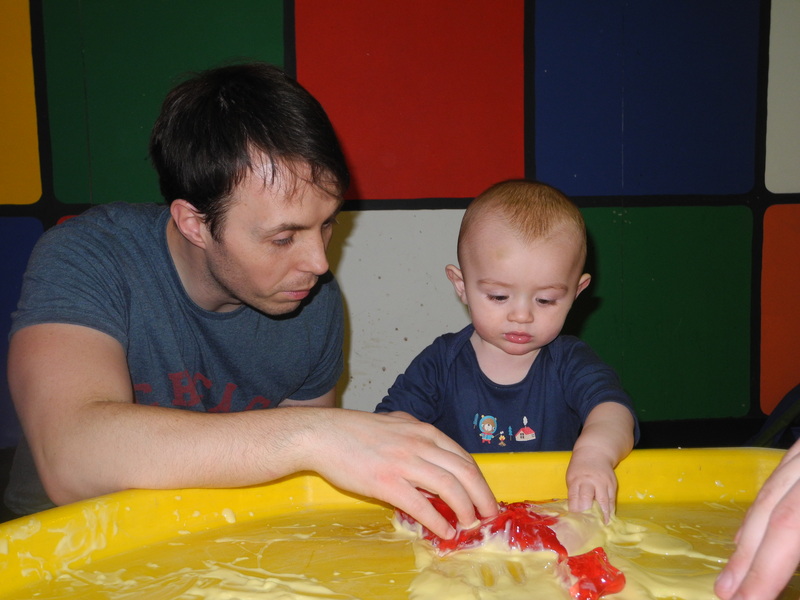 Preschool age: Baby sensory (0-13 months), toddler sensory (13-36 months), unaccompanied creche sessions (three hours long, themes include Secret Kingdom, seaside discovery, Zoo Keepers animal magic and Space Explorers), messy play (zoo time, space rangers and party time), beast hunts (nature, secret village and pond dipping). Age 4-7: Mud Mystery clue hunting adventure, Bluestone Buccaneers pirate experience, panning for gold, Tawny Tales puppet show, Into the Wild nature adventure. Age 8-12: Celtic team challenge, woodland survivor, 4×4 safari driving, high ropes, sky wires, assault course, woodland warrior. On the water: Family raft wars, Welsh coracles, kayaking. The Big Four (age 6+): Get roped up and prepare for The Swing as you sail through the air like a pendulum, plummet on The Drop from 39ft, try the climbing wall, and the 20ft high indoor ropes adventure. Thunder Games (8+): Catapult, cross-bow, archery, laser clay shooting. PS LOVE the Guns & Roses T-shirt where did you get that? Ha! It’s from Next ? Thanks, it’s good to hear you think it’d be helpful ? That’s a really clever idea for playtime, my 11 month old would love it! I got brave and cracked out the corn starch and water and home today. It wasn’t too bad. It washes off easily with water. We did do it outside in the 35 oC heat though…perhaps not a British ‘Springtime’ activity.